The Band I chose for this Poster is The Growlers. I've seen them live three times and they are amazing. I've got footage and lot of photographs I've taken from their concerts. In other words, I'm confident that I know them well enought to create something that they'll like. The poster will be a collage of illustrations and lettering to convey the style of their music which is a cross between psychedelic and beach goth. I took the picture above at one of their concerts and modified the color to show the vintage look I'm going for. Below, it's an early sketch of the type treatment of the logo. I've been doign lettering for a while and this poster will allow me to experiment with a more loose, jazzy psychedelic style. 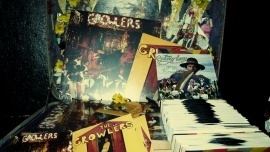 If you look close you'll see that the "o" in Growlers appears to be screaming or growling. Below is a collage of image that i'm referencing to for my color palette and illustration style. The drawing in the center is the layout of the poster. The type arrangement is different from the sketch I have above but it has the same feel. I'm open to suggestions on different layouts and type treatments. As far as texture, I have different kinds of paper textures and brushes that I've made and collected over the years but it will have that parchment collage, vibe. I explored a few more layouts looking for a more illustrative style. For this poster I'm going with the top right skecth on the image below. I think it shows a balance bewteen the dark and psychedelic style I'm going for. The letters will still be drawn and will have a more sketchy style without sacrificing legibility. Thank you for your feedback!